Greece Crete Who Were the Ancient Minoans of Early Crete? The Minoan civilization enjoyed enormous success in internal and foreign affairs, yet even at the height of its power, it was not a match for that of Mother Nature. Myth and mystery surround the Minoan civilization in Crete, a name derived from the mythical king Minos who was known to have hidden an equally mythical creature, the Minotaur, in a deadly labyrinth. Who were these people who lived on Crete over 3,000 years ago? Travelers en route to Greece, from the east, frequently paused in Crete but over time, they settled in the fertile hills to farm the land or raise livestock. They brought with them a culture that was highly evolved and very likely inspired by the lifestyle of the Egyptians and Babylonians. The community suffered when a strong earthquake shook the island sometime between 1750 and 1650 BC. 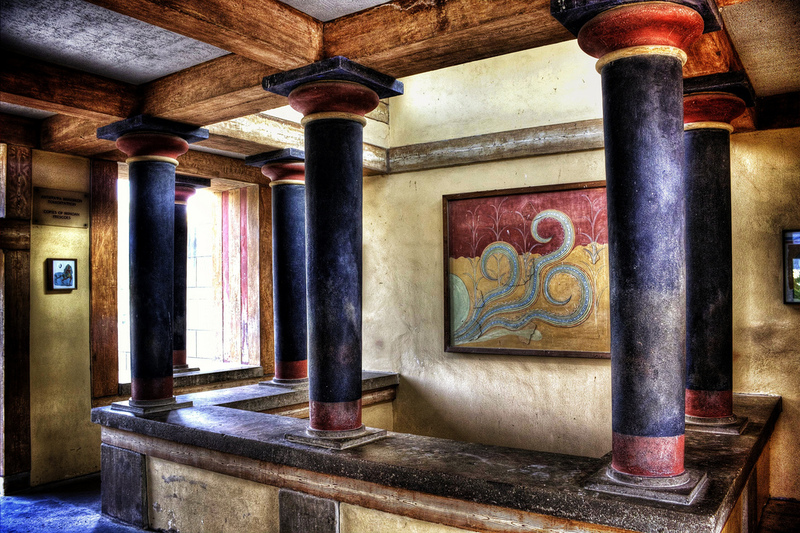 From the rubble, the Minoans rebuilt their society in even greater splendor than before. 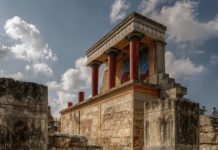 Knossos, previously the center of Crete’s social culture, also became the political capital of the island. Crete was ruled by one king in a similar fashion to the Egyptian pharaoh with political and religious power. Greek mythology names him as King Minos. Creature comforts that were discovered thousands of miles away in a valley between India and Pakistan were brought to grace the halls of the palace. Running water was supplied to the bathroom via terracotta tubing to service toilets and bathtubs. A sewer system was installed and rooms were possibly heated by running tubes of hot water from volcanic springs. The palace was really a little city with housing for the king and queen, gardens, prisons, stores and artists workshops. Designed around a large square, they created a maze of halls and alleys that may have given rise to the mythical labyrinth. It was again destroyed when the volcano Thera erupted and a tsunami, larger than that of 2004 in the Indian Ocean, crashed on the island. Artisans such as goldsmiths, leathersmiths, and potters held an important position in the city’s hierarchy. They transformed raw gold, silver, tin, copper, leather and precious stones from around the world into valuable goods to be re-sold to Egypt, Asia Minor, Greece and Sicily. Wine, oil, honey, grain material, and ceramics also were sold. The Minoans were very modern in culture and social custom. Women enjoyed a position equal to men whether at home or at work and also held positions in religious rites. The Minoans viewed ‘Woman’ as their principal divinity. The goddess of fertility was represented by a provocative woman dressed in typical Cretan costume: hair arranged with jewels and pearls, long ruffled skirts with bodices open in front and bosom in full view. She held serpents in both hands and a dove was perched upon her head. The bull was considered a sacred beast and a symbol of nature’s power. Ancient Crete may be mostly remembered in connection with Theseus and the Minotaur, but Minoans really did sport with bulls. The object was to bare-handedly catch the infuriated animal by the horns and jump onto its back into a standing position. The cause of the Minoan downfall is unknown. Several devastating earthquakes and war with the Myceneans may well have been strong factors. Without the ability to decipher the ancient writings of the Minoans, known as Linear A, their history remains shrouded in mystery and speculation. Leone, Maria. The Island of the Minotaur. Focus Storia.